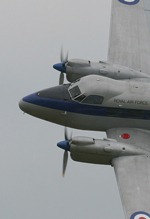 Joining Old Warden and Abingdon on the opening weekend of the UK's 2015 airshow season was the Classic Air Force's 'Airbase Gets Airborne' event, held at Coventry Airport. 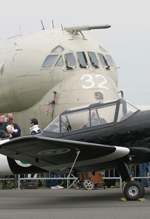 The show had been mooted as the 'return' to Coventry for the fleet, following a financially unsustainable two years at Newquay Airport in Cornwall. The Classic Air Force has always been known as a living, breathing collection and so quite appropriately the flying programme for the afternoon contained only airframes owned by that organisation. Alongside the flying display, engine runs and pleasure flights kept the roughly 2,500-strong audience entertained. Joe Malkin risked the cloudy forecast in order to attend the first airshow held at the airport in some 11 years, and reports for UK Airshow Review. Addtional photography from Tom Jones. Coventry is a unique place. Despite this being an airshow, the collection had not lost the charm felt at much smaller events it has held previously. 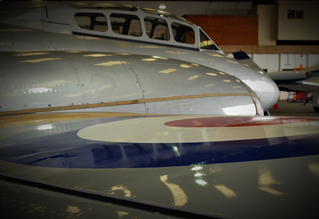 The 'open-house' nature of the site meant visitors virtually had free reign of the maintenance hangars packed full of aircraft, with a great opportunity also to see the facilities used to keep this diverse group of aircraft in the air. Similarly, the handful of stalls were almost entirely aviation related, alongside an albeit small but high quality range of food outlets. That is something many shows could learn from! 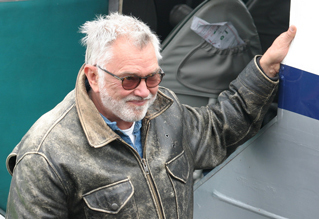 Pleasure flights were being offered in the Chipmunk, Dove and Dragon Rapide, and actor Martin Shaw looked very pleased to have taken a flight in the latter midway through the flying programme. Shaw later appeared on the PA system to commentate on something very unique to this show. There had been much press attention throughout the day on a bright orange Xtreme XA-42. The reason? The airport was also playing host to actor Idris Elba who is filming a series for Discovery where he is put through a number of high-octane challenges. One of these challenges was participation in an aerobatic competition, which was held on the day, and extensively covered using on-board cameras as well as a helicopter. The flying itself took place away from the airfield, however those present later got to view the initial rushes, showing Idris's routine as well as those of three other competitors. The result? Well, you'll have to watch the show to find that out! The airshow was opened by CAF Chief Pilot Jon Corley flying a solo display in the Anson T21. Given it is such a sprightly performer, the 'Annie' never seems to appear at enough shows, and so it was super to see it being demonstrated in the Coventry skies. Jon later flew a similarly pleasing routine in the Dove, full of photo friendly topside passes. The Dove replaced the collection's Pembroke in the display - following a lengthy overhaul, the aircraft needed a final CAA inspection before it could fly again, and despite best efforts this could not be accomplished in time for the event. However this was perhaps a blessing in disguise as it gave the opportunity to hear the Dove's pair of Gipsy Queen engines singing sweetly. Also flying was the Jet Provost T5A, which whilst rather distant, gave a good account of the aerobatic prowess of the most powerful variant of this classic RAF trainer. After static appearances at a number of fly-ins, the event saw the flying display debut of the Proctor V, recently restored in the colours of an aircraft used by the British Embassy in Washington. This display, flown by CAF Chief Engineer Ben Cox, showed the Proctor's distinctly British lines off to great effect. The Proctor was developed from the highly successful Vega Gull, and to this end it was exciting to hear commentator Jem Shaw discuss the CAF's plans to perhaps include a 1930s air race theme at a future show. There is a whole host of relevant aircraft in Britain and it would be wonderful if some of these could be attracted to attend. Corley scored a hat-trick of displays over the course of the afternoon by closing the flying programme with the Meteor NF11 alongside John Dodd in the Vampire T55 in a revival of the classic RAF 'Vintage Pair' displays. Following a communications problem with the Vampire which delayed its start-up, and a need to stick to strict airport slot times, the Meteor's solo display was very brief, and in declining weather. However, not at all does that take away from the sight of these vintage jets making a number of passes in close formation; a real highlight of the show. Sadly there are one or two gripes about the airshow. The nature of the site means much of the crowdline is surrounded by a high fence, making photography in all but a few areas nigh on impossible. It was said that at future events more 'camera ports' (holes) will be available in the fence, however this is just likely to be a cause for arguments as only a handful of attendees will get to use them, as they can only realistically fit one camera each. The ideal solution would be for some sort of access to be arranged to the open area to the east of the CAF compound, obviously with temporary metal fencing. This would ensure a clear open crowdline without high fencing, aircraft or buildings to interfere with the line of sight. The decision similarly to site pleasure flying aircraft right in the central area did not help with this as it added to an already limited view. Also, given that only a trio of pilots were flying the displays, there were a number of lengthy gaps between display items. Perhaps a good compromise to the two above issues would be for flying display aircraft to taxi back and park in the central area, and then be towed away (rather than lined up around the corner) - also giving the opportunity to see more happening. Hopefully at future events more participants might be in attendance which may alleviate this problem. The event did seem to intersperse nicely with the usual Coventry movements, although some commentary on these as they happened would provide something else to look at as well as adding to the 'open house' idea by letting visitors learn about some of the other flying that takes place at the airport. The event finished with a Coventry tradition, the runup of the Avro Shackleton, owned by the Shackleton Preservation Trust. Sadly the number 3 engine refused to start, however the aircraft never fails to impress nonetheless; the sensation of the ground shaking and the props spinning is always a great one and we look forward to seeing what lays ahead for the Trust. Also running throughout the day were two radial engines - a Bristol Hercules and an Alvis Leonides. These too made for powerful sights, and both were displayed by keen owners. Indeed, the owner of the Bristol Hercules mentioned he also has a Bristol Centaurus under rebuild - what an exciting prospect that is! Overall, it was a very promising start for the Classic Air Force, and a great day seemed to be had by all in attendance. It was not perfect, indeed at times it did feel like it was needing a bit more; but it is crucial to remember not only was this the first show, but it is run by volunteers and a collection already busy focussing on keeping itself running, organising an airshow on top of this is no mean feat. However the flying on display was excellent all round, and gave the opportunity to see some unique types in the air. There seems to be a lot of potential, and with a bit of development this could definitely be realised. The prospect of future events being held at the site is an exciting one, and may give the opportunity to see a different selection of the Coventry treasure trove in the air. Undoubtedly, Coventry could make its name as a stalwart of the UK airshow scene if it perseveres and succeeds with this format.